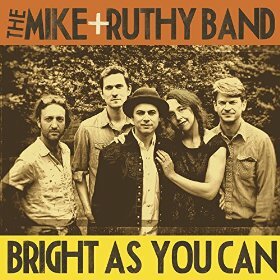 Much of their music reflects the powerful driving Americana of 'The Band' but Mike & Ruthy's stylistic influences are a little more defined from song to song meaning that their songs can sometimes veer recognizably closer to specific genres, such as folk or country, but the comparison is used more to illustrate a powerful individuality that realistically owes nothing to no one other than themselves and the absorbance of their myriad influences that are blended into something unique. Thirteen of the generous fourteen songs on the album were written by Mike Merenda and Ruthy Ungar except for the quite stunning countrified duet tribute The Ghost of Richard Manuel which was written by Josh Davis of the hugely talented roots band 'Steppin' In It'. Every song has an unusual feel, even the purer country or folk are far from standard fare and this is genuinely an 'Americana' band that are recognizably different to everyone else. With the range, power and versatility of Ruthy's vocals this is a band that is never going to stick to one generic field, except for the broad expanse that is 'roots music.' She can veer from a gentle folksiness to hard country and almost to a divaesque sensibility on the more up tempo songs. Mikes harmonies are equal to the job of supporting such a dynamic vocalist though, as are the other backup vocalists, and the duets are something really special. They even at times evoke a folksier Fleetwood Mac thanks in the main to the lovely vocals of Ruthy but also to some of the production techniques, which are highly skilled and show huge variety and diversity. That huge variety applies to the sounds, tempo's and even styles but all are tied together by what is becoming Mike and Ruthy's recognizably high quality stamp. The album opens with Bright As You Can a speedy folksy song that has an early Fairport feel, eventually joined by steel guitar with an excellent percussion, beautiful lead vocal from Ruthy and high quality as well as atmospheric fiddle and harmonies. Chasin' Gold is driven by a powerful bass and percussion with a tuneful guitar starting a slower tempo song off before Ruthys gorgeous vocal comes in, soon partnered by steel guitar and lovely harmony vocal. There is an exquisite fiddle solo and eventually another by the steel guitar on what is an unusual country song. Legends Only Appear In Black And White is another unusual song and is subjected to a spooky dense, cacophonous start, soon becoming a strange brooding tale with the fiddle propelling the song on a peerless Mike & Ruthy duet that has a powerful haunting atmosphere. Simple And Sober is a complete contrast, with a gentle acoustic guitar intro before being joined by Ruthy's lead vocal on a song that starts as a folksy tale but gradually becomes a gorgeous mellow country ballad with steel guitar. This is an absolutely stunning song on which every element works perfectly, something that realistically can be applied to every song on this album. On Golden Eye there is a chugging electric guitar and bass that are soon joined by the banjo on a song that has a funky atmosphere and a repetitive feel that is quite addictive. Ruthy sometimes goes 'off piste' with her vocal meanderings that seem to add even more of an addictive element as does the occasional brass inclusion on yet another unusual but tremendous song. Final mention goes to Goin' Out a song on which they really get sidetracked on a jazzy vaudevillian tale that has echoes of a New Orleans bluesy jazziness! It has a 'chirpy' production that brings a nice lightness late on to the album despite being a song that has great depth as well. The brass that kicks around in the song gives it an improvisational feel, always centered by Ruthy's expressive vocals. There is an intense power and dynamism in the Mike and Ruthy Bands music that when added to their stylistic versatility and supreme quality sets them apart from just about any other band in the roots music genre. It is impossible to speak too highly (although i've tried) about this incredible albums qualities but I don't expect to be the only 'scribe' to make it a strong challenger for album of the year!